Here’s a question: What do you do when you receive an email informing you that you’ve been shortlisted for an experiential activity where you are given some pocket money to go explore your city, free overnight stay at an OYO rooms premium hotel and complimentary breakfast in return for an honest review? Let me answer my own question: I accept. I rejoice. I get excited. I’ll tell you why. To me, it was not just another blogging activity. It was a mini dream come true because I constantly fantasize about just taking a day off and enjoying myself without any pressure or agenda – and booking myself into an hotel to complete the mini-vacation. It was a happy occasion where I got to have fun with bloggers whose company I enjoyed. Also, I had been receiving daily emails from the OYO rooms guys urging me to try their Rs.999/- only AC rooms with WiFi and complimentary breakfast and just to prove that creative marketing campaigns work, I was on the verge of taking action when I got selected for the “#OYOxplorer activity” along with bloggers from four cities – New Delhi, Gurgaon, Mumbai and Bangalore. 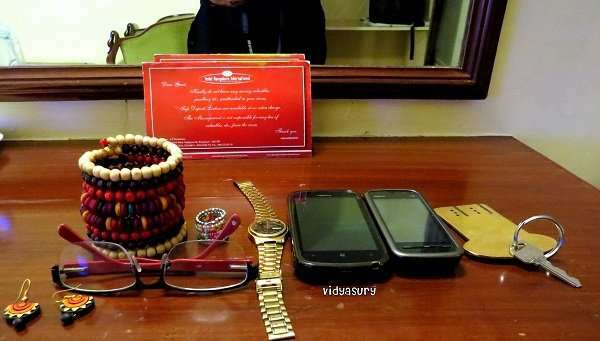 We were instructed to report at noon on May 30, 2015, at the OYO rooms premium property at Hotel Bangalore International, Crescent Road, High Grounds, near Race Course, in the heart of Bangalore and easily accessible in terms of tourist attractions, shopping and entertainment. 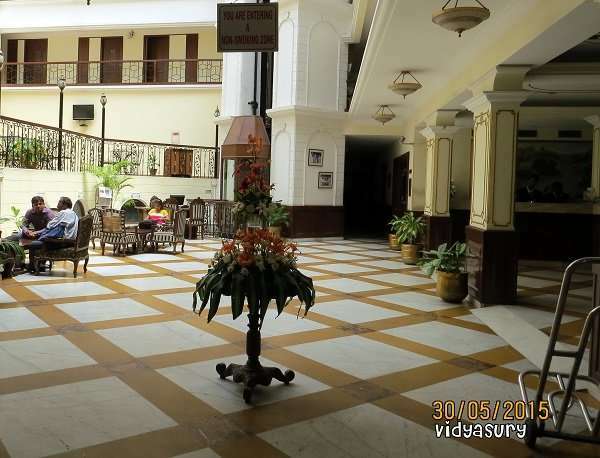 The agenda was to collect our “OYO rooms” swag and some spending money, check in to the hotel and take off to explore our city as tourists with no fixed plan, then return to the hotel, spend the night, enjoy the complimentary breakfast, check out at 11 am on May 31 and review OYO rooms on our blogs. And oh, we were also instructed to post selfies throughout the day. Arrgh! Initially I was in two minds as my son had an entrance exam on May 30, but my folks urged me to go ahead and so, after making a large cheesecake and a big bowl of apple crumble and cooking lunch, I set off leisurely to the hotel. The hotel is a mere ten minutes away from where I live and I admit that made it all the more exciting. I was welcomed by the very pleasant OYO rooms staff. In fact when I was en route, they called me to connect and give me directions. Shrinidhi was already there and while we were chatting, Shailaja arrived. Six more people were expected. We checked in and were shown our rooms. After leaving our overnight bags we returned to the lobby where we discovered that Roohi Bhatnagar and Meghana Hassan had also arrived. 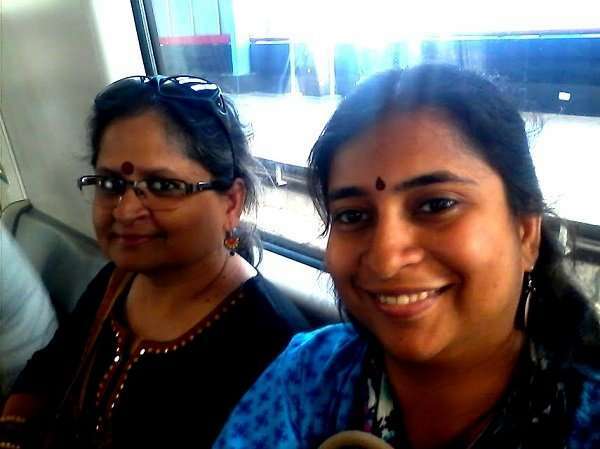 Shailaja and I had a sort of itinerary and we set off to Mantri Mall to have lunch and stroll around a bit, until the outside temperature cooled a bit. The interesting thing is – the previous day it had rained like there was no tomorrow, but the weather forecast for May 30 was no rains and 6 degrees warmer. 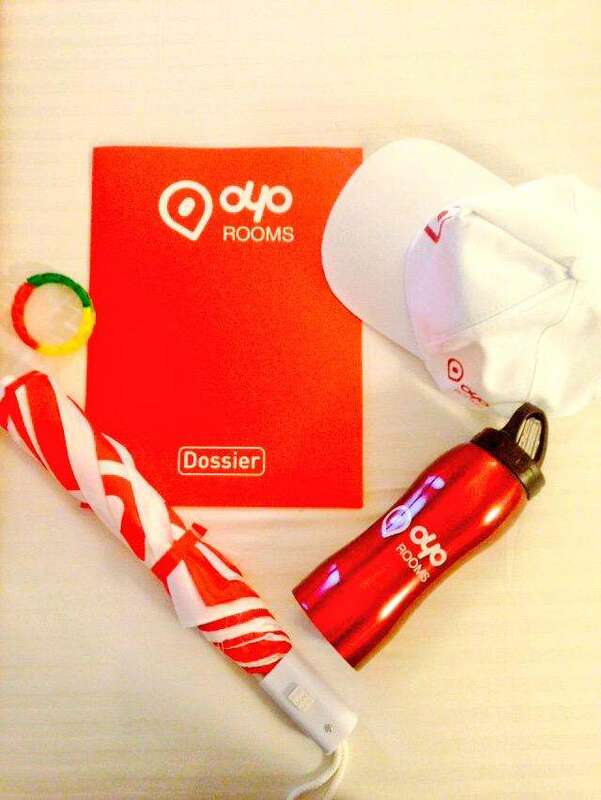 Ah well, the OYO rooms guys had given us a water bottle, an umbrella, and a cap to keep us cool. Selfie with Ranbir Kapoor – celeb? From Mantri Mall we headed off to MG Road, to take the Metro to Bangalore Santhe, a beautiful crafts village near Byapanahalli. At the entrance to the Metro, we met this charming school girl who spoke flawless English, managing her Mother’s fruit cart. 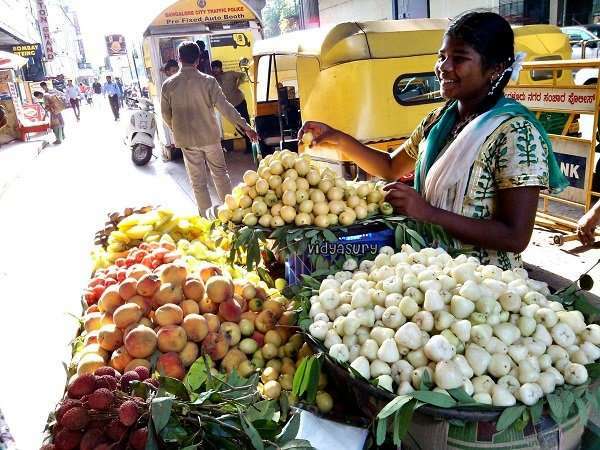 These delicious rose apples, jamuns, litchis, star fruit and water apples are unique to summer. Apparently her Mom bought the fruits from the main market every day and since this is school vacation time, she was minding the business for her. What a smart responsible kid – and confident and cheerful! We bought some water apples from her and went into the station to get our tickets. We took the wonderfully air-conditioned Metro and got off at our stop to meet the heat. At Bangalore Santhe, we were a bit disappointed to see that not many shops were open. I had visited this place last year when an event was in progress and it was just fabulous. But I thought the place had a charm all its own even with many of the shops deserted. While chatting with one of the vendors, I learned that there is not much foot traffic and he was there only because it was mandatory for him as an employee of the Tourism department. He cheerfully explained the story behind the display. By this time, I was hankering after a cup of coffee and on inquiry, discovered that one of the shops served it. So we looked for it and were delighted to discover that we could get tea and coffee there. What a lovely experience. We then took the metro back to MG road and strolled along the art gallery which is always a pleasure. Soon enough, Koshy’s, one of Bangalore’s iconic eateries came into view and we felt peckish. We had a welcome snack before resuming our walk, this time heading off into Church Street. I was amazed to see how different it looked with all the new additions and renovation going on. 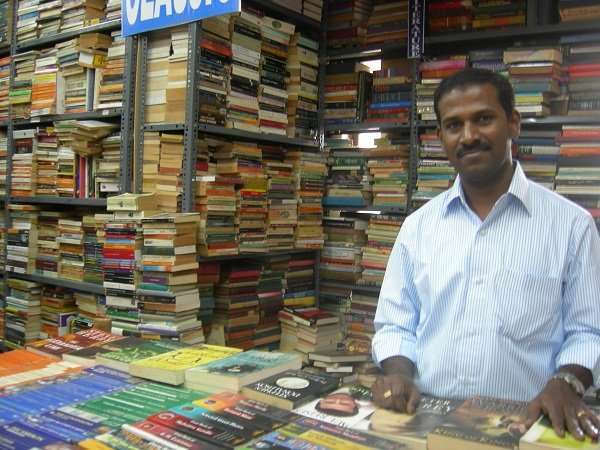 We reached Blossom Book House the brainchild of Mayi Gowda, easily one of Bangalore’s hotspots for book lovers. Oh I remember when the store started around 2001 and we were all raving about it – a book heaven literally packed tight with old as well as new books. Suddenly we heard our tummies rumbling and deciding to go in for some Chinese cuisine, went to Red Bamboo Shoots. Yum yum. By the time we finished dinner, it was close to 10 pm and we figured it was time to return to the hotel. We got a cab back. Once we got to our rooms, we changed and freshened up – hey, the night was still young and we spent a pleasant couple of hours chatting – appreciating the lovely day we had had. I read for a while before I finally slept at 2 am. Comfy bed, but I found I could barely sleep – I have a problem with soft pillows! Still, I was peacefully awake as I waited for dawn to break. Since breakfast was from 8 am to 10 am, we were ready by 8 and went over to see the delicious array on the breakfast table. The others also arrived and we took pictures together and chatted. It was fun to hear what they had been up to the previous day. Breakfast done, we were ready to check out and head home after promising each other that we’d keep in touch. 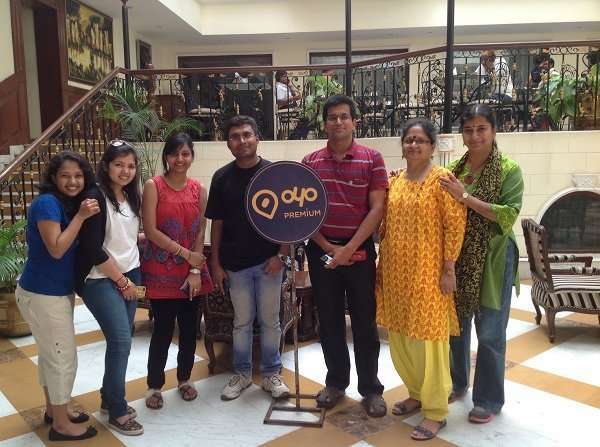 All in all – I thought this activity was a brilliant initiative by OYO rooms – what a unique way to engage real users to promote their service and get feedback via reviews! Here is the selfie challenge they gave the participants – and it was truly a challenge for me. While I got over the block of actually clicking selfies, technology presented a hurdle as my data connection freaked me out. I did manage to upload some on Twitter. Ah well. Wishing for a day out with a friend, and having it happen! Each blogger got a different type of room – some rooms were better and more spacious with more luxurious bathrooms, a balcony and so on. I thought that was a good strategy by the OYO rooms guys to get feedback about the rooms. My room was nice. The attached bathroom was less than satisfactory. No tissue roll, stained potty, leaky flush lever that dripped directly on to the empty tissue roll stand, leaky fixtures that wouldn’t work, tough to operate taps, a shower head and tap that turned on simultaneously – and no shower cap – which meant I had no choice but to get my hair wet and bad WiFi connections. TV and Fridge wouldn’t work at the same time as there weren’t enough plug points. I called reception for assistance and 15 minutes later, had to remind them again after which they sent staff with attitude. I believe that all these can, and will, be easily fixed by OYO rooms, as my other blogger-friends obviously had a pretty good experience. So, yes, I will use OYO rooms, and if the room is not satisfactory, request a change. As simple as that. I didn’t do that during this activity for the sake of the review. Yes, I enjoyed the #OYOxplorer activity and loved playing tourist in my own city! 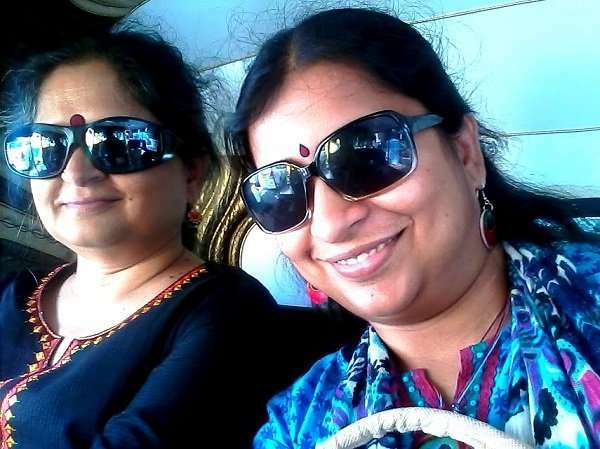 Good times become better in great company, and I thank Shailaja for making it that much more fun! To make the traveler’s life easy, there’s an OYO Rooms Budget Hotels app you can install to find rooms and get great deals. OYO Rooms is India’s largest network of branded hotels. It currently operates in 16 major business and travel destinations including Delhi, Mumbai, Bangalore, Hyderabad, Pune, Chennai, Goa, Jaipur, Gurgaon, Noida, Ghaziabad, Manesar, Neemarana, Kolkata, Varanasi and many more to come. Their standardized budget rooms start at Rs.999/- with free WiFi and breakfast. Nice to meet you and other bloggers at the event. Indeed, Shrinidhi! A wonderful experience. I sure wish I could have tagged along. ~grin~ Nice job on the photos. I don’t like having my photo taken (let alone trying to take a selfie!) but it’s nice to see your beautiful face, my dear, so I’m glad you managed. That bookshop is a dream place, Susan! 🙂 It was a lovely day! I just loved the format of the whole activity! Thank you!